With Endgame, the future of Sonic the Hedgehog was up in the air. The comic, which had relied so heavily on the concepts of Adventures of Sonic the Hedgehog and the Saturday morning series, could no longer fall back on the status quo of those shows. With the defeat of Robotnik and the reclaiming of Mobotropolis, the future was suddenly unsure. With the 48-page special Brave New World, it was clear that the comic felt it still had life in it even if Robotnik wasn’t the main villain. The world of Mobius was not yet safe, one victory not suddenly making everything the way it was before Julian turned on King Acorn. While wrapping up Endgame, Ken Penders found himself in a unique position. With the sales of the Sonic series still going up, those in charge of Archie Comics decided they would expand the line, adding a new title to the Sonic universe they were building. The character who would headline the comic? Knuckles the Echidna, whose previous mini-series had outperformed the solo outings of Princess Sally and Miles “Tails” Prower. When a second mini-series had been commissioned, it didn’t take long for the powers-that-be to decide to make it an ongoing, offering it first to the writer that had been instrumental in setting up the character in the first place. My partner Mike Kanterovich and I had just been given the go-ahead to develop a story introducing the new character featured on the SONIC 3 game cartridge, KNUCKLES THE ECHIDNA. Naturally, our first decision, regarding how we were going to write the new character, was a no-brainer. KNUCKLES may have been indigenous to the Australian wildback, and he may have the dreadlocks to do any Rastafarian proud, but he was most definitely a “dese”-“dem”-&-“dose” Brooklyn kind of guy. Which is exactly how we wrote him in our original script. Dedicating the story to the legendary comic writer and artist Jack Kirby, Issue #13 introduced the Echidna in the simplest way possible, matching the lighthearted, slapstick style that had filled the comic at that point. I’ve talked about the game adaptation previously on the front page, unaware of the fact it almost didn’t go to print. So unsure was Sega of America on what direction Knuckles’ character would take, they didn’t allow a second story until months after the game Sonic & Knuckles was released, explaining why their game tie-ins never seemed to be on time. Once SEGA let up on their control of when Knuckles could show up, Ken found himself working with a blank slate. The backstory for the newest member of the Sonic cast was still vague at this point, especially without the translated materials from the Japanese manuals. As long as SEGA put their stamp of approval on it, Ken could take Knuckles in any direction he chose. So when the chance came to write the series, he seized it. 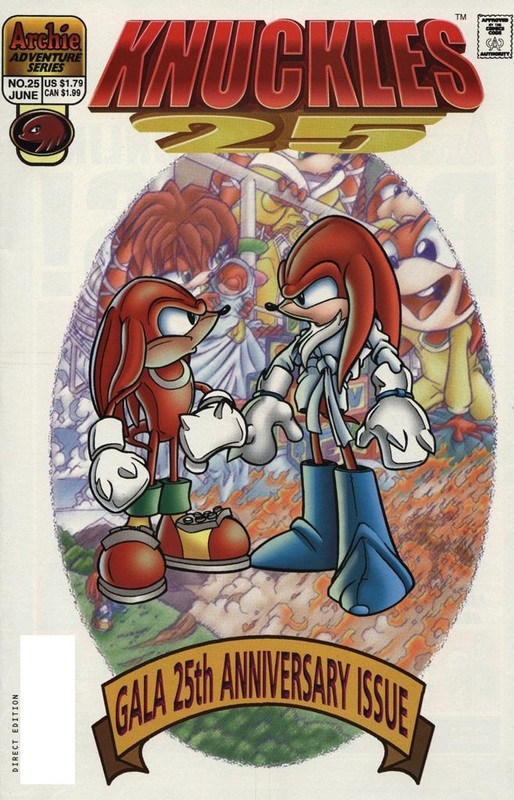 Regarding my focus on KNUCKLES and the Echidna Race, around the time I was writing the ENDGAME saga, I was offered the assignment of writing the new KNUCKLES series. If I took that, however, I wouldn’t be focusing on SONIC much if at all. I decided to go with KNUCKLES for professional reasons, to see if I could make a series successful with what little I had to work with. 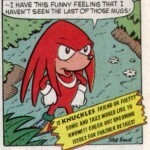 While KNUCKLES never sold as well as SONIC simply because he was a lesser known character in the market, the book did sell very well in comparison to many other comics at the time. Ken ran with that freedom, building an entire world around Knuckles that didn’t rely on the characters of Sonic, “Tails” and the Freedom Fighters. 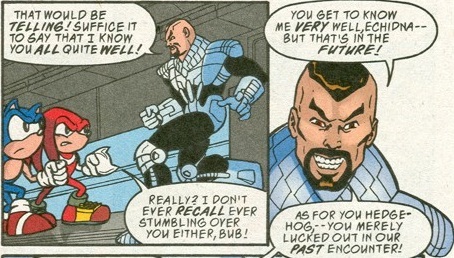 Though there were occasional cameos and crossovers, the two comics were significantly different entities, only sharing the same backdrop of Mobius. Though Ken and Karl would sometimes get into arguments about certain characters and plotlines that affected both books, Ken focused on his series, only vaguely keeping up with what Karl was doing, choosing not to read his material. It isn’t known exactly when Ken began thinking about Knuckles and his immediate universe in broader terms. It’s entirely possible that, after Endgame, Ken wanted to challenge himself, creating an epic far beyond the scope of Sonic #36-50, using Knuckles as the main focus. As with any epic, the thought of what the ending would be like started creeping into Ken’s mind. 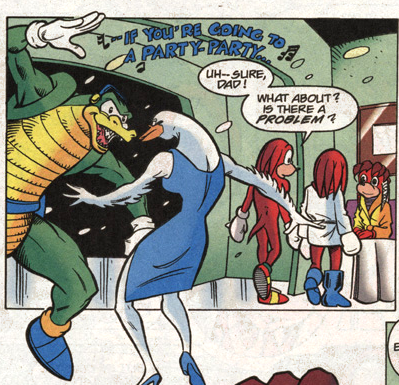 The earliest hint that something was up was at the end of Knuckles the Echidna #6, where some vague dialogue by a couple of fireants led him to a room with a hat. Yes, the same hat that he would end up wearing in Mobius: 25 Years Later. 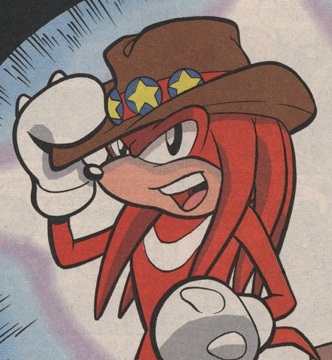 Ken actually wanted to have Knuckles wear the hat in the main series, but found that SEGA wouldn’t allow it, a strange piece of copyright law that prevented the hat to be used in the comic as it was already being used in the OVA. Vague dialogue of Knuckles’ grand scheme in the universe continued to be dropped, but the first proper allusion to the future of Mobius? Sonic Super Special #7. Yes, the issue where Sonic and the gang meet Spawn. It was one of those crossovers that didn’t make sense at the time. Sonic the Hedgehog, primarily a kid-friendly franchise, crossing over into the Image universe, a company who built themselves on the reputation of being edgy and dark. A creator-controlled environment where writers and artists didn’t have to worry about following the rules of DC and Marvel. While Spawn only made a brief cameo, other Image heroes such as Savage Dragon, Shadowhawk and Velocity became far more important to the plot. Bookended by a not-so-subtle Mulder and Scully parody, the entire story focused around a character named Particle and a villain named Dr. Droid, who is never actually referred to by name. Particle and Droid were not Sonic characters, and at this point, neither were they from Image. They simply served as plot devices to allow these two universes to meet up, the Freedom Fighters using the Cosmic Interstate to chase Particle, who had stolen the Master Emerald so she could give it to Droid and rescue Keri. Who is Keri? We’re never told. The entire story is one big mess, which could take pages trying to explain it all. 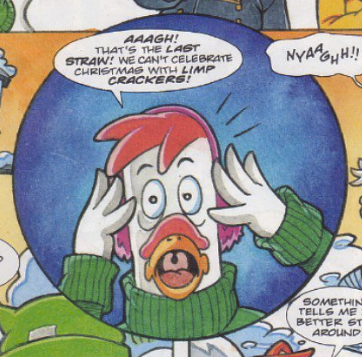 The main reason the crossover came to be was as a means for Ken Penders to help launch his own personal comic, The Lost Ones. Published by Image (though only lasting one issue), Particle was meant to be the star, with Droid and Keri appearing as the series was to continue. 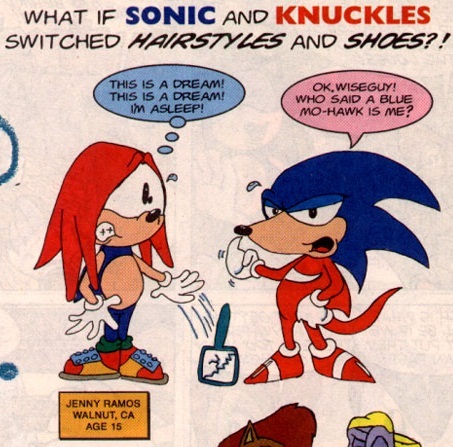 The crossover was simply a trial run, a way to connect Ken’s work in the hope that if Sonic fans loved what Ken wrote in Sonic and Knuckles, they would want to run out and buy his other comics. So why am I bringing this up? Well, Dr. Droid makes a reference that he and Knuckles had faced off once before, and the reason he can’t remember is because it hasn’t happened yet. Why Droid thought he would be able to win this time around, I don’t know. Maybe he thought going up against a younger Knuckles would work in his favor even if it caused a paradox, but hey. I’m not the one who wrote it. This encounter with Droid? One of Ken’s actual original creations? Funny story behind that. My concept for [Robo-Robotnik] was vastly different from the original Robotnik in that the character utilized technology that allowed itself to grow, adapt and morph into different versions. If you refer to the SONIC LIVE! Special, you’ll see yet another variant of the same character, which I thought of as the Ultimate Version. This version was featured in segments whenever the future was referenced throughout several of my KNUCKLES and M:25YL stories. Yet another possible version of Robo-Robotnik was introduced in SONIC SUPER SPECIAL #7 in the form of Dr. Ian Droid, my character from THE LOST ONES. Weren’t expecting Sonic Live! to become a part of this, were you? Though the above makes it sound like the “Ultimate Version” of Robo-Robotnik and Dr. Droid are separate, Droid’s dialogue makes it pretty clear they are meant to be one and the same. His reference about meeting Sonic also makes a bit more sense, as whichever alternate version of Robotnik in Sonic Live! was meant to become Droid certainly didn’t do a whole lot. Thinking of Sonic Super Special #7 as simply a middle chapter to a larger story, it’s possible that it would have made much more sense down the line, but with the majority of the story never seeing the light of day and the parts that did being vastly different than what was intended, it just becomes a strange piece of comic history, largely forgotten and more than likely never to be republished. The tale of Dr. Droid and Knuckles’ fight in the future was already tentatively on the schedule when the Image crossover was published. Entitled Knuckles: 20 Years Later, the story was originally meant to be seen in Sonic Super Special #9, though it was delayed for unknown reasons, pushed back to Sonic Super Special #13. 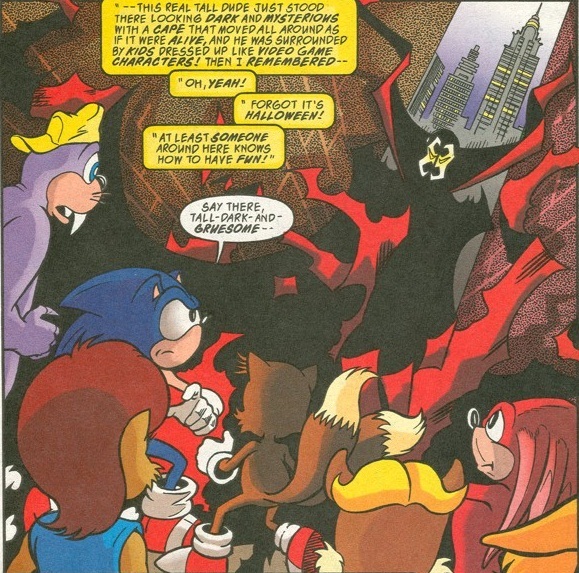 The delay gave the entire team the perfect opportunity to tease the upcoming tale, where it was first announced in the pages of Knuckles the Echidna #25. 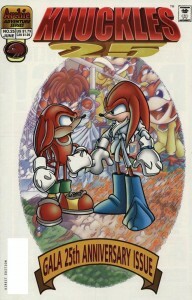 The issue revolved around the reunion of Knuckles and his father Locke, whom he hadn’t seen since he was ten years old. By this point he had already rediscovered Echidnapolis and reunited with his mother, the father-son moment postponed until the anniversary issue. With Locke explaining the reasoning behind making it look as if he abandoned his son to live alone on the floating isle, he made reference to a nightmare he had – a prophetic telling of an apocalyptic future. With an editor box proudly declaring the announcement of Knuckles: 20 Years Later, it was the first time we were able to see what was in store for a story Ken had already been teasing online. The image of a strange, Robotnik-like robot causing chaos and destruction on Angel Island, with Knuckles being the only force in his way, made fans all the more excited. Ken let it slip that Dr. Droid would be a part of it, holding back his relationship to Robo-Robotnik. Over the coming months, in chatrooms and message board posts, Ken would continue to tease what was in store for our heroes in the future. The idea that Knuckles and Julie-Su were together but not married was something planned early on, as well as the fact the two would have a child. Originally Lara-Su was to be 14, only one year older than the children of Sonic and Sally. The story was not supposed to start with Lara-Su in class, however. 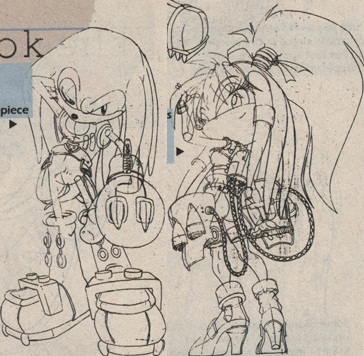 The original opening sequence was meant to focus on Julie-Su finding out she was pregnant, “to tip off the readers immediately that this story is going to be unlike any other Knuckles story they’ve read.”  The mention of Sonic’s kids was never meant to be an important part of the plot, simply a confirmation that the future seen in Sonic: In Your Face! had come true. That’s right: the future that was written because no other satisfying conclusion to Princess Sally’s first solo story arc could be thought of, the future SEGA forced Ken to make an alternate universe, and a future that he was willing to throw away in Endgame…it was right all along. Shocking. 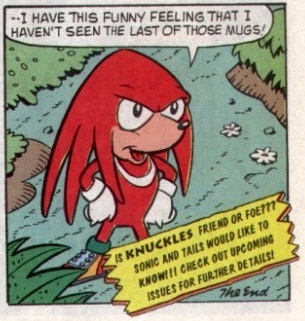 Knuckles: 20 Years Later did not see print in the thirteenth issue of the Sonic Super Special series. Though Ken was already plotting out the Knuckles comic to Issue #50 and beyond, fate would be far less kind than how it was to its sister series. Right as Ken was plotting out the three-issue “King of the Hill” arc that would feature in Knuckles #30–32, word came out that Archie was canceling Knuckles’ solo series. To Ken’s own admission, learning the title was ending knocked “the wind out of my sails,”  going so far as to call the final issues bad comics. Though he tried to get fan outcry to save the series for, at the very least, another two issues, there was no resurrecting the title. The hope for those last two issues was simply to keep the pacing of the Sonic Adventure adaptation that was scheduled immediately after. 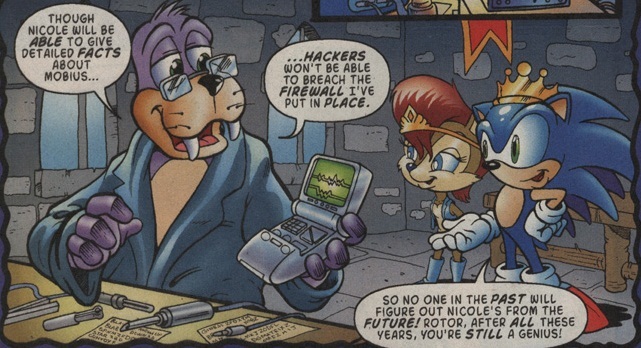 While Ken was busy working on the road to fifty with Knuckles, the Sonic comic was doing its own build-up to Issue #75, with the preceding issues hinting at the return of the character everyone had seen die in Endgame – Dr. Ivo Robotnik. While the original intention was to resurrect the dictator, changes in the story decided that it was not the Robotnik everyone had read about before that was returning, but instead Robo-Robotnik. Yes, from Issue #19. Seems that after his brief cameo in Sonic #22, Robo was able to build himself a new body, and defeat his own version of the Freedom Fighters. Bored with his victory, he learned that the Sonic he once faced off in a parallel world had defeated his version of Robotnik, and felt it necessary to hop on the Cosmic Interstate to face off against the Sonic that once bested him. First showing up in the design most familiar to fans of the Saturday morning series, the issue shows the destruction of that body, replaced with the design of Dr. Eggman as seen in Sonic Adventure and beyond. It would be a few years before Robo-Robotnik became a flesh and blood being again, but the reason for Robotnik’s return was simple. It had been five years since Sonic & Knuckles was released on the Mega Drive, and Sonic was coming back in a big way. The Dreamcast was being released in the west, and SEGA wanted Archie Comics to adapt the game as soon as possible. With the cancellation of the Knuckles title, the content that was supposed to be in there was shuffled over to the main Sonic comic, awkwardly forced in. Sonic Super Special #13 was solely dedicated to the adaptation as well, and with SEGA not even providing a script for them to work off of, the staff at Archie had to deal with an imported Japanese copy of the game to figure out just what the heck they were supposed to write about. An unequivocal mess, all things considered. But what about Knuckles: 20 Years Later? It was pushed back once again, meant to show up in Sonic Super Special #16. It didn’t show up there as the 48-page specials were also canceled, leaving the story with no home. Next time, we jump back into the review, and finally get to see Sonic the Hedgehog. Hey, his name is on the cover. “Sonic-Grams” Vol. 4: Who Wants To Dress Up As Knuckles With Me? Dude these things are wierd. That’s why I pay attention to the Mega Man comics. I remember going to Sega of America in August and, I forgot that one guys name “Arron…..?” , he gave me a Sonic Special graphic novel that had a bunch of 25 years later stuff, a Sonic CD lanyard, A christmas card, a rare pin, and a SEGA bag. It was cool. I can’t wait for “When Worlds Collide”. Oh look, it’s Spaz, being incredible.